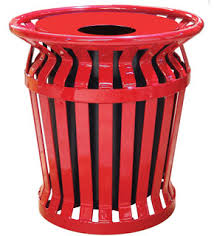 [XPB-RB32-X] Our 32 Gallon Ring Banded Receptacle is fabricated of welded steel construction. This receptacle comes with liner and spun metal or ash bonnet lid. The ash bonnet lid features an ash tray above the receptacle. There are 16 color selections to choose from. For shipping quotes, discount pricing, orders or questions please call our Customer Service Center at 1-877-483-9270.